Learn about how breakdancing, as the representative dance element of hiphop, stands as an integral part of the whole hip-hop culture. Hip hop is a phenomenally successful youth-oriented culture that has now reached every corner of the globe, just as rock'n'roll did a generation earlier. Also like rock'n'roll, hip hop emerged in the exuberant decade following a prolonged military conflict, in this case the Vietnam war. Hip hop encompasses music, dancing, art, poetry, language and fashion. Its originators were from the inner-city immigrant strata of society: frustrated young people who felt disenfranchised by the system, excluded from mainstream culture, and desperate to express themselves. So the hip hoppers utilised what was around them. They spraypainted the walls, they danced on street corners, they hooked-up to lamp-posts to power their sound systems. They took what already existed and turned it into something new, exciting and different. Popular songs were transformed by 'deejaying' techniques. Martial arts were incorporated into dance styles. 'Emcees' manipulated the language into a new nomenclature. Much of what these cultural entrepreneurs did was illegal, condemned, or otherwise disapproved of. But hip hop is now a global multi-billion dollar industry, and those same entrepreneurs who contributed to its success are now engaged in a desperate attempt to maintain the roots of hip hop and, in the now-familiar phrase, 'Keep it real'. Anyone who plays a record on a turntable can call himself or herself a Deejay. But hip hop deejaying, or turntablism, is a complex art. At its simplest it consists of a pair of turntables, an audio mixer, and original recordings. Upon these the deejay performs techniques such as mixing, scratching, cutting, and sampling, to create an entirely new piece of music from the original track. The roots of hip hop deejaying lie in the Jamaica of the 1950s and '60s, where the sound system was an efficient way to transport music around the country, and the deejays were popular and often flamboyant entertainers. Musically it was an innovative period, with the emphasis on rhythmic experimentation. The afterbeat, the rock steady beat, ska, dub and reggae all developed during this period. And deejays were experimenting not only with music, but also with technology. In 1968 King Tubby created the dub style of music by leaving out portions of the vocal tracks on a dub plate (the local term for the acetate disc), and effectively creating a new version of a song - what would today be called a 'remix'. In the 1960s many Jamaicans emigrated to the USA, winding up in the inner-city ghettos of New York. One of these immigrants was DJ Kool Herc. In the late 1960s he used to deejay at parties, where he would chant improvised rhymes over the instrumentals and breaks of popular songs. Since these intervals weren't really long enough to get a good rhyme going, he would put two copies of the same record on the turntables and use an audio mixer to switch between them, allowing him to loop the breaks for as long as he needed - hip-hopping on the turntable. These became known as 'breakbeats' - and hip hop deejaying was born. Throughout the 1970s and '80s deejaying techniques became ever more sophisticated as the music and the technology developed side by side. Hip hop and electro musicians will look back with fondness on such classic instruments as the Moog Synthesizer, the TR-808 drum machine, and the Technics 1200 turntable - the deejay's Stradivarius! When scratch deejay Mix Master Mike joined the Beastie Boys in 1998, scratching really made it to the mainstream, and formed a special relationship with Nu-Metal. Bands such as Limp Bizkit, Linkin Park andIncubus added a deejay to the traditional guitar-bass-drums line-up. Hip hop cognoscenti will hotly debate exactly when, where and who invented such techniques as cutting, scratching, beat juggling, and breakdown. But it was Grandmaster Flash and Grand Wizard Theodore, the New York deejays, who brought all these styles and tricks to a wider audience. The 1981 album The Adventures of Grandmaster Flash on the Wheels of Steel is a prime example of early turntablism, and was a landmark hip hop release. Despite the profusion of technologies now available to contemporary artists, these techniques remain the essential arsenal of any turntablist. 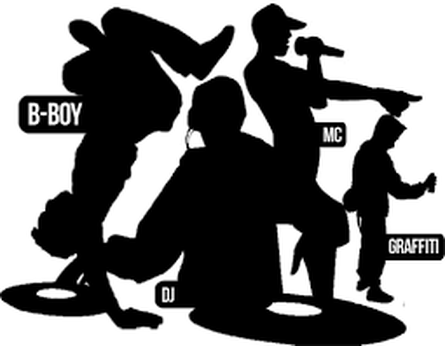 The breakbeats of hip hop deejaying also gave birth to the dance form known as 'breaking' or 'B-boying'. B-boys would dance during the breaks spun by the deejays, hence the 'B' stands for 'Break'. (The more popular term 'breakdancing' was coined by the media, and is rarely used by breakers themselves.) Breaking is a high-energy combination of complex footwork, spins, kicks and 'freezes' - holding a position balanced on hands, head or shoulders. The two strongest influences on breaking styles are Kung Fu (due to the incredibly popular Kung Fu movies of the 1970s) and the African-Brazilian martial art, Capoeira. Unsurprisingly, the flashy yet disciplined moves that the kids were seeing on screen or on stage found their way to the dance floor. The heart of breaking is the battle, where individuals or crews compete for dance supremacy. In order to get into a good crew, you had to battle the members of that crew to be accepted. Some of the original crews are still very much on the scene: New York's Rock Steady Crew, and Air Force Crew in LA, have been going since the 1970s and now have chapters all over the globe. In the UK breaking has never been as popular as it is elsewhere. France, Germany, Korea, Japan and Belgium have thousands of talented Breakers easily capable of challenging the Americans at their own game. Like deejaying, emceeing also made its way to the US from Jamaica. Most people associate emceeing with rapping, but rapping is only one Emcee technique. Some Emcees are experts at human beatbox (the human voice imitating percussion sounds using the microphone) or 'call and response'. Everybody in the house say Yeah! So full of action my name should be a verb. Traditionally, rap lyrics have discoursed on two themes. The first is a celebration of the rapper's own prowess, bigging up himself or his deejay and crew. This is battle talk, the element of competitiveness being very strong in all aspects of hip hop. The second is socio-political, and ranges widely from Grandmaster Flash's 'The Message', an elegy for life in the ghetto, to the passionate invective of Boogie Down Productions' 'Sound of Da Police', released a year after the Rodney King trial and the LA riots. More recently, Eminem has brought rap narratives off the streets and into the (broken) home. For some reason, a term such as 'graffing' hasn't really caught on, though the term 'tagging' is often used. The 'tag' is the writer's signature, and the most prevalent example of graffiti art. The tag that made graffiti famous was TAKI 183, the 'nom de graf' of a 17-year-old kid called Demetrius, who tagged as he rode around on the New York subway. When the New York Times published an article about him in 1971, graffiti art exploded - especially on the subway. New York's graffiti-covered subway trains are now a symbol of the city, as famous as London's red buses. There are three main types of graffiti art, the tag being the first. The next stage is the 'throw up', which is an evolved tag with perhaps more of an outline, two colours and so on. The throw up is also the next stage historically, as the advent of the spraycan allowed mere tagging to graduate to more colourful and intricate styles. Having perfected your throw up, you may then consider moving on to composing a 'piece', a full-on masterpiece of graffiti art. To be called a piece, it must consist of at least three colours. Pieces that stand out for their creativity or vibrancy are known as 'burners'. In New York City, the spiritual home of graffiti art, you get 'top-to-bottoms' and 'end-to-ends' - it's not difficult to work out that these refer to pieces created on subway cars. The graffiti artist's grail is the 'whole car' - a long and difficult feat that takes plenty of planning, time and people. One of the best-known 'whole cars' is the Christmas Train of 1977, painted by members of the Fabulous Five crew. Of the different elements of hip hop, graffiti art still has the most negative image in the eyes of the world at large. Yet there are graffiti artists, such as Keith Haring or Lee Quinones, whose art has graduated to galleries. Graf Art is essentially a public art form, often incorporating political and religious themes. But it is often condemned along with vandalism as being anti-social and destructive, and there is no First Amendment to help artists defend it. The artists would argue that it is not destructive but creative, transforming the oppressive urban landscape with an art that originated with the earliest cave painters. In hip hop theory, the belief is that this modern culture actually springs from old and deep-rooted instincts. African music, art, martial arts and dance drove the creative spirit of a new generation to transform the world around it, and to engender a culture in which freedom of expression - however controversial - is what is of paramount importance. The essence of hip hop truly is the transformation of existing objects and forms.